Editing Preferences are settings that provide a means to customize your work in Photoshop Elements and to fine-tune the program according to your personal work habits. There are two Preferences dialog boxes. One Preferences dialog box is available in the Edit Full mode workspace, and the other is available in the Organizer workspace. This article covers the Preferences dialog box that you open when in Edit Full mode. Preferences, which you can access in Edit Full mode, are contained in a dialog box that’s organized into nine panes. By default, the Preferences dialog box displays the General pane. To open the Preferences dialog box, choose Edit→Preferences→General. (Or choose Photoshop Elements→Preferences→General on a Macintosh.) Alternatively, press Ctrl+K (cmd+K on a Macintosh). The General pane in the Preferences dialog box. 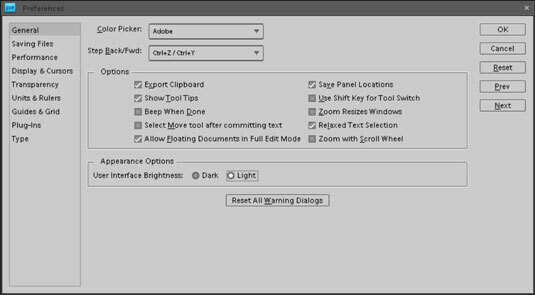 Panes list: Photoshop Elements lists all the different panes in the Preferences dialog box along the left side of the dialog box. Click an item in the list to make the respective pane open on the right side of the dialog box. OK: Click OK to accept any changes made in any pane and close the Preferences dialog box. Cancel: Click Cancel to return to the same settings as when you opened a pane and to close the dialog box. If you hold down the Alt (Option on Mac) key, the Cancel button changes to Reset, and clicking that button performs the same action as clicking the Reset button. Prev: Switch to the previous pane. Next: Switch to the next pane. You can also press Ctrl+(1 through 9 keys) to jump to another pane. Or press cmd+(1 through 9 keys) on a Macintosh. General preferences, as the name implies, apply to overall general settings you adjust for your editing environment. Saving Files preferences relate to options available for saving files. You can choose to add extensions to filenames, save files with layers or flatten layers when you’re saving a file, save files with image previews that appear when you’re viewing files as icons on your desktop, and save with some compatibility options. Performance preferences is the pane where you find history states and memory settings, such as scratch disk settings. Display & Cursors preferences offer options for how certain tool cursors are displayed and how you view the Crop tool when you’re cropping images. Transparency preferences require an understanding of how Elements represents transparency. Imagine painting a portrait on a piece of clear acetate. The area you paint is opaque, and the area surrounding the portrait is transparent. To display transparency in Elements, you need some method to represent transparent areas. Open the Transparency preferences and make choices for how transparency is displayed in your 2-D Elements environment. Units & Rulers preferences let you specify settings for ruler units, column guides, and document preset resolutions. Guides & Grid preferences offer options for gridline color, divisions, and subdivisions. A grid shows you nonprinting horizontal and vertical lines. You use a grid to align objects, type, and other elements. You can snap items to the gridlines to make aligning objects much easier. Guidelines can be dragged from the ruler and positioned between guidelines. Plug-Ins preferences include options for selecting an additional Plug-Ins folder for storing third-party utilities to work with Elements. Type preferences provide options for setting text attributes. You have options for using different quote marks, showing Asian characters, showing font names in English, and previewing font sizes.